Maliki’s Baathists and Faysal al-Lami: Towards Another Confrontation? Keen watchers of Iraqi politics will recall a dramatic headline in Al-Hayat on 24 February 2010, shortly before the 7 March parliamentary elections: The head of the de-Baathification committee, Ali al-Lami, announced that 376 high-ranking officers in the Iraqi army were subject to de-Baathification and should be removed from their posts. The list of names included such prominent officers as Abbud Qanbar and Abd al-Muhsin al-Kaabi. In short, these were Prime Minister Nuri al-Maliki’s guys – Shiites who had worked for Saddam Hussein and had subsequently been coopted by Maliki. They were being attacked by a fellow Shiite in the de-Baathification committee with ties to Ahmad Chalabi, one of the most zealous exponents of a hardline de-Baathification policy. Flash forward to today’s situation and the continuing debate about who should get the security ministries in Nuri al-Maliki’s still incomplete second government. In the sea of rumours and counter-rumours on this issue, one particularly interesting item is a report this week that Ali al-Lami is once more attacking Maliki and is trying to marginalise some of his candidates for the ministries of defence and interior. Lami has told an Iraqi news agency that proceedings are underway to exclude the top candidate for the defence ministry post, Khalid al-Ubaydi, for unspecified reasons relating to de-Baathification. He has also added that investigations are ongoing concerning the frontrunner for the interior ministry, Ibrahim Muhammad al–Lami, on the grounds that he had received the Quds order for his service for the Baathist regime in the late 1990s. The rationale for excluding Ibrahim al-Lami seems particularly odd since the relevant legal framework – the accountability and justice law of 2008 – is strictly based on combinations of rank in the Baath party and type of job in the security ministries as a basis for exclusion from all or certain jobs in the state bureaucracy. Instead, and not for the first time, Lami seems to be creating his own indicators of de-Baathification without making specific reference to the accountability and justice law. Beyond the questionable legal basis for the exclusion, the case has interesting political ramifications. What we are seeing is basically a heated internal Shiite struggle about pragmatic versus hardliner approaches in the question of de-Baathification. Ali al-Lami and the candidate he is seeking to exclude, Ibrahim al-Lami, are not only both Shiites, they probably both hail from the Banu Lam tribe of south-eastern Iraq! As for the wider political dimensions, it is noteworthy that Ahmad Chalabi appears to enjoy the support of the Sadrists as far as the security ministries are concerned (they are interested in letting Chalabi himself have that portfolio). The issue does not end with the internal Shiite struggle. Maliki’s candidate for defence, Khalid al-Ubaydi, first emerged as an Iraqiyya candidate but has since met with opposition from inside Iraqiyya, in particular from Ayyad Allawi. Some say this is because Ubaydi is considered too close to another Iraqiyya leader, Usama al-Nujayfi. In other words, it appears Ubaydi is being favoured by Maliki and Nujayfi (and White Iraqiyya) and is being opposed by Chalabi, the Sadrists and Allawi! Going forward, the fate of these two internal struggles – pragmatists versus hardliners on de-Baathification inside the all-Shiite National Alliance, as well as pro-Maliki (Nujayfi, Mutlak, Eisawi?) versus anti-Maliki (Allawi, Hashemi?) 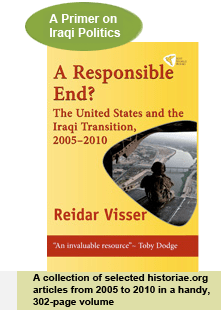 inside Iraqiyya – could have an impact on several momentous issues in Iraqi politics, including the oil law, Kirkuk and the question of a renewal of the SOFA with the United States. Indeed, it could have an impact on the survival of the second Maliki government itself. After the local elections in January 2009, Babel was one of the most contested Iraqi governorates when it came to agreeing on a new governor. After a long stalemate, an alliance of State of Law, the Sadrists and Iraqiyya decided to sideline ISCI and formed a coalition with a new governor considered loyal to State of Law and Prime Minister Nuri al-Maliki. The Babel governor, Salman al-Zarkani, became one of the casualties of the latest public demonstrations in Iraq when he was instructed by Maliki to tender his resignation. However, it seems that Maliki and his party subsequently lost control of the battle for the next governor. The recently-elected new governor, Muhammad al-Masudi, is thought to be leaning towards ISCI and other smaller blocs independent of State of Law. One particularly interesting aspect of developments in Babel is the recent selection of a second deputy for the speaker of the council. The council speaker, Kazim Majid Tuman, is a Sadrist, whereas his first deputy, Sabah Abbud Hasan Mahdi Allawi, duly elected in 2009, is from the secular Iraqiyya. Recently, however – and apparently as part of the deal that led to the election of the new governor – a second deputy to the speaker of the council has been elected. The new second deputy to the speaker is also from Iraqiyya: Mansur Hussein Mani Hummadi. The idea of a second deputy speaker does not have any basis in the law on the powers of the governorates of 2008. In itself, it seems to echo an unfortunate tendency in Iraqi politics called muhasasa or quota-sharing, which often leads to an inflation of deputies as new posts are created basically in order to accommodate appointees of the political parties. Now, interestingly, this latest creation of a second deputy speaker is being challenged by two parties that appear to be on the defensive in Babel: Maliki’s State of Law, as well as the Sadrists, who have promised to send the matter to the federal supreme court. The court may find it difficult to rule in the matter. It has previously said it does not adjudicate disputes that relate to the interpretation of laws in force as such (only the constitution), and yet on numerous occasions it has in fact used arguments precisely from the law on the powers of the governorates even in cases of constitutional review! There are certain parallels to the recent dispute about the number of presidential deputies, although in that matter the constitution at least offered some guidance and left the issue as basically a political question. As for the political aspect of the new developments, one can get the sense that ISCI and Iraqiyya in this case are coming closer together again at the local level, but with the Sadrists still sticking to their alliance with Maliki. At the national level, things are looking slightly different right now, with the Sadrists reportedly still supporting Ahmad Chalabi as new interior minister, and with Iraqiyya apparently fighting among themselves about who should be the new defence minister after Khalid al-Ubaydi (reportedly pro-Nujayfi) was recently dismissed as their candidate and replaced with others (Fasih al-Ani and Hikmat al-Jahishi). Today, an agenda for this week’s last parliamentary meeting (Thursday) was published; once more it fails to include any mention of security ministries. If things continue to drag on like this, Maliki may well end up in a situation where developments in the governorates could ultimately create greater challenges for him at the national level. Postscript: In a breaking-news update out of Baghdad tonight, ISCI’s Adil Abd al-Mahdi says he is no longer a candidate for vice-president. This could further affect the overall political dynamics sketched out above. In particular, it will be interesting to see how the main candidate to another of the vice-presidential positions, Tariq al-Hashemi of Iraqiyya, reacts. It was all utterly predictable. A Reuters journalist wanted to get an eye-catching headline and a new angle on the conflict in Bahrain, and, no surprise, he managed to find one: “Bahrain showdown divides Iraqis on sectarian lines”. All he then needed was a single Iraqi Sunni who could present a dissenting voice to the Shiite parties – which have been loud in expressing solidarity with the Bahraini demonstrators. Unsurprisingly, he succeeded in that respect too. His victim was one Ahmad Yunis, described as a “Sunni lawyer”, who thought he saw an Iranian hand in the Bahraini uprising: “If we look at the critical situation in Bahrain, we would be too naive if we ignored the Iranian fingers. Having a Gulf country ruled by a Shiite majority would make Iran more proud than having the atomic bomb”. And voila, Reuters had its story, and the idea that sectarian conflict might re-erupt in Iraq because of Bahrain could find a receptive mainstream media audience worldwide. Today, the Iraqi parliament presented a far more nuanced take on the situation in Bahrain. True, many of the speeches in support of the Bahraini demonstrators were given by Shiite Islamists, as could perhaps have been predicted. But there were other dimensions too. Kurdish and Christian deputies added their support for the Bahraini opposition. A gathering of female deputies seconded a motion to protest against the highhandedness of the Bahraini authorities; Salman al-Jamili, a Sunni from the Iraqiyya list expressed sympathy with the [mostly but not exclusively Shiite] demonstrators who in his view had been “marginalised” by the [Sunni] regime. And ultimately, it was the Sunni speaker of parliament, also from the Iraqiyya bloc, Usama al-Nujayfi, who cancelled the rest of today’s session in protest against what the [Sunni] regime in Bahrain is doing. He called the Bahraini uprising a “popular movement” and also condemned “interference” in Bahrain, which in the current situation can only mean the Saudis and other GCC states. Nujayfi’s action should give pause to those who want to reduce him to some kind of Saudi marionette. At least from that point of view, his action today was a positive one, as it once more showed that Iraqi Sunnis are far ahead of most other Sunnis in the regions in terms of building relationships of trust with its fellow Shiite compatriots and in recognising true popular movements, whatever their sectarian make-up. Incidentally, relations between the Sunni Arabs and the Kurds also took a step forward today: Parliament formally issued a decision condemning as genocide the Halabja massacre in 1988 during the closing phase of the Iran–Iraq War. What was perhaps less positive about the whole affair was the fact that the parliamentary recess had after all been anticipated anyway because of the Kurdish New Year celebrations this weekend (i.e. following the Persian calendar). It should be remembered that since it began a new session last summer after the 7 March 2010 elections, parliament has in fact only been able to issue two laws, i.e. the budget and a law on the deputies of the president (it has been unable to actually elect those deputies). Additionally, the whole affair provided yet another excuse for postponing the parliamentary confirmation of new security ministers, which appeared to have gathered some momentum this week only to be absent from the agenda when parliament convened this morning. Parliament is now on vacation until 27 March. Prime Minister Nuri al-Maliki will remain acting minister for defence and the interior. Who would have thought that one year after the declaration of the final election results and his defeat at the ballot box in late March 2010, he should be able to demonstrate such remarkable staying power? Ismail Alwan al-Tamimi, a lawyer from Wasit governorate, has mounted a legal challenge before the federal supreme court in which he accuses Prime Minister Nuri al-Maliki and Speaker of Parliament Usama al-Nujayfi for “unconstitutionally” appointing three deputy prime ministers (Salih al-Mutlak, Hussein al-Shahristani and Rosch Shways). Apart from its intrinsic interest as a case of a tentative constitutional challenge to the much-criticised practice of ethno-sectarian quotas in Iraq’s post-2003 political culture, the move will also draw some attention for the fact that Tamimi was also involved in a past challenge in 2010 against the then temporary speaker of parliament (Fuad Masum of the Kurdistan Alliance) for prolonging the “first session” of the parliament indefinitely and thereby postpone the political process – a matter where the federal supreme court actually sided with those who challenged the temporary speaker. Additionally, Tamimi works for the embattled governor of Kut/Wasit – a governorate dominated politically by Maliki’s own State of Law Alliance. Alas, Tamimi’s challenge is a complete waste of time. His argument is that the constitutional enumeration of two vice-premiers belongs to the section of the constitution that related to the now bygone transitional period of 2005–2010. That in itself is of course correct. But the more important point is this: There is nothing constitutional that prevents Maliki from appointing any number of vice premiers if he thinks that is politically advisable. He can have one, three, or, for that matter, ten. Briefly, the constitution says nothing about the number of ministers, and only political wisdom will limit the imagination in this regard. Some will of course say that this limit has already been overstepped, but the point is that Maliki can constitutionally appoint ministers for the moon and the sun if he so desires, and then add deputies. What this all boils down to is that it is political not a constitutional question and if the prime minister wants to appoint a ludicrous number of placemen then it is his prerogative to do so and it is the role of the parliament – not the federal supreme court – to pass its verdict. Truly judicial issues that remain connected to the formation of the second Maliki government are firstly a number of unconstitutional replacements of deputies who went on to become ministers, and, secondly, the unconstitutional use of past members of the presidency council (Adel Abd al-Mahdi and Tareq al-Hashemi) in a new role as temporary vice-presidents for the ordinary president without any parliamentary approval. (Talabani says he has issued an order for them to “stay in their jobs” but he has no constitutional authority to do so and in any case the “deputy of the president” and the “deputy of the president in the presidential council” are two completely different jobs that have no relationship to each other. *) It should be added that within the cluster of cases relating to replacement deputies one can make a similar sub-typology to distinguish between cases that are truly within the judicial and constitutional sphere (which relate mainly to changing the governorate of a deputy during the replacement), and those that are not strictly speaking against the law on replacement of candidate but instead relate to the number of votes obtained by a candidate under the open-list system. The latter cannot be challenged before the federal supreme court even though some of these cases clearly do involve deputies who received a miniscule number of personal votes and as such constitute an insult to the Iraqi electorate, if nothing else. In any case, even if this second group of truly judicial/constitutional cases may offer a more promising avenue for criticising the seemingly endemic cronyism of Iraq’s new political system, it is unclear whether the federal supreme court would be up to the challenge of tackling any such cases in a mature fashion. Indeed, in the case of the deputy replacements it is unclear who has the right to mount a challenge within thirty days of the parliamentary ruling on the issue – the constitution just establishes in article 52 that such a right at least exists. So far at least, despite growing popular unrest across the country, there are worringly few signs that the Iraqi political elite is beginning to realise that the protests are not only about local councils and governors, but also about the way politicians perform at the national level in Baghdad. Perhaps someone who can rouse them from their sleep is the Grand Ayatollah Ali al-Sistani? For the second time in a few weeks he has reportedly sided with those demonstrations that Maliki blamed on “Baathists”: First he expressed sympathy for the protests in a public announcement (bayan) dated 26 February; today there are reports that he refuses to meet with any government officials pending an improvement in the general sitution. *Footnote: The legal election of Abd al-Mahdi and Hashemi, for whom there is political support in parliament, is held up mainly because of the continued candidacy of the unpopular Khudayr al-Khuzai of Maliki’s Shiite alliance. There are basically two ways of looking at the relationship between the dominant Shiite and Kurdish political parties in Iraq since 2003. One view emphasises converging interests – such as constructing a black and white narrative of the country’s past as “Sunni Arab discrimination” against everyone else; systematically playing up ethno-sectarian identities in politics; distributing leadership posts not on the basis of merit but according to ethno-sectarian quotas; and generally keeping any tendencies of the re-emergence of a strongman ruler in Baghdad in check. The contrarian position is to emphasise differences between the two, such as the tendency of many Shiites to maintain at least a façade and rhetoric of Iraqi nationalism (even if recruitment patterns may well be sectarian in practice), hold on to the vision of a mostly centralised state ruled by a strong prime minister in Baghdad, and reject the multiplication of new federal entities south of Kurdistan as well as Kurdish moves to annex additional territories outside the ones recognised as part of the Kurdistan Regional Government in the Transitional Administrative Law of 2004. Key developments since 2005 present a mixed scorecard as far as these two competing perspectives are concerned. The new constitution of 2005 itself was of course basically the creation of the Shiite and the Kurdish parties, but there are two trends within that constitution. Some clauses favour the Kurdish view of unlimited decentralisation, which at the time resonated with the views of at least one Shiite party (SCIRI). The very limited powers of the central government and the award of residual powers to both governorates and federal regions in article 115 point in this direction, as do the provisions for creating new federal regions south of Kurdistan in what could theoretically turn in to a cycle of perpetual federalisation. On the other hand, other constitutional articles such as 121–122 point towards a more centralised form of government south of Kurdistan. Similarly, the constitutional arrangements for the end of the transitional veto-wielding presidency after the first five-year parliamentary cycle foreshadowed a potentially strong prime minister with a centralist and Iraqi nationalist language emerging in the future. Later on, the failure of the Shiite and Kurdish parties in 2007 – arguably at the point of their greatest influence – to amicably agree between themselves on an oil law and the disposition of the disputed city of Kirkuk highlighted the extent to which centralist ideals continued to make themselves felt in the Shiite camp, at the expense of Kurdish interests. At one point between 2008 and 2009 it looked as if Nuri al-Maliki was making decisive moves towards establishing himself as the nationalist centralist enabled by the 2005 constitution, again to the detriment of the Kurds. But with the re-emergence of sectarian politics in the autumn of 2009, the Shiites refrained from re-entering into conflict with the Kurds over Kirkuk during the debate of the elections law. More recently, as Maliki emerged with a poorer result than he had hoped for in the March 2010 parliamentary elections, he saw no other option but to turn to the Kurds for support and has recently made conciliatory moves regarding Kurdish oil exports. It is interesting, therefore, that the latest statement on Kirkuk by Iraq’s president, Jalal Talabani, a prominent Kurdish leader, seems to have once more created strains in the Shiite–Kurdish relationship. Talabani said Kirkuk was the “Jerusalem of Kurdistan”. This prompted strong reactions from Iraqis south of Kurdistan – Sunnis and Shiites alike – who objected to the connotations of “occupation” assigned by Talabani to the current situation (in which Kirkuk at least formally remains part of the central-government domain) and the concomitant discourse of an ethnic “liberation campaign” that would appeal to ethno-racial Kurdish sentiment to annex the area to Kurdistan. Significantly, today there is a strong condemnation of Talabani’s statement by Maha al-Duri, a Sadrist leader. In a press statement also published on her website, she says that Talabani’s statement was “irresponsible”. Moreover, she went on to escalate the issue by saying that if Talabani considered Kirkuk his Jerusalem, it would “force Iraqis to consider Kurdistan their Jerusalem”. She seemed to modify that perspective somewhat when she went on to say that all of Iraq should be considered “occupied” (by the Americans) and that Talabani should understand the need for US forces to leave. It is significant that this statement is not coming from the usual suspects. On Kirkuk and Kurdish issues more broadly, certain people close to Maliki are in the habit of making strong statements apparently without being able to influence the overall direction of policy to a significant extent. This includes Turkmen leaders like Abbas al-Bayati. Duri, on the other hand, is considered a high-ranking politician among the Sadrists who unexpectedly fell silent during the debate (or, more correctly, the non-debate) on Kirkuk during the passage of the revised election law in parliament in autumn 2009. A 38 year-old mother from Baghdad who graduated top of her class from Baghdad’s leading veterinary college in the late 1990s, Duri stands out as one the few female deputies who has asserted herself beyond women’s affairs. Duri’s statements are not an isolated case either. Today in parliament, an interesting echo was produced by Mansur al-Tamimi, a Basra deputy from State of Law, who called for expanded powers for the governorates, but “with a strong supervisory role for the prime minister”. This prompted a Kurdish outburst and charges that Tamimi had failed to recognise the “federal” character of Iraq. Parliament speaker Usama al-Nujayfi of Iraqiyya duly sustained the objection and confirmed the standard ittihadi (“federal”) adjective for describing Iraq. But among the Shiites, those who vocally protest against “excessive centralisation in Iraq” now mostly seem to belong to ISCI, which after all is a small minority. A more immediate and material dimension to the whole affair has been provided by the recent influx of Kurdish peshmerga troops into Kirkuk, presumably to deal with potential disturbances, but a breach of past protocol according to which they have stayed away from the city. Prime Minister Maliki himself was present in parliament to give an update on the progress of the government and its programme. He sounded somewhat exhausted when he finally uttered the mandatory “federal” word towards the end of his speech. The Kurds may remain his best friend in troubled times, but at a juncture when the nationalist Iraqiyya is remarkably silent on Kirkuk (they are still seeking the good offices of the Kurds in their dealings with Maliki and have not said much except from some criticism from members who are themselves from Kirkuk), he is probably increasingly aware of the challenge from Iraqi Shiites who prefer to speak in the name of the centralist state. It is not a good omen: In the context of unprecedented political anger in the Iraqi streets, parliament today voted to ignore the country’s constitution and its own laws. In a ruling on the validity of deputy replacements that occurred subsequent to the formation of the Maliki government last December (i.e. deputies who joined the government and gave up their seats in parliament to be replaced by others), both constitutional and legal provisions were conveniently sidestepped. Specifically, in today’s ruling, parliament validated the memberships in the assembly of six deputies against whom objections had been raised: Jawad al-Bulani, Faris al-Sinjari, Mina Salih Mahdi, Muhammad al-Hindawi, Abdallah Khalaf Muhammad and Jawad Ghanim al-Shuhayli. At least three of those cases (Bulani, Hindawi and Shuhayli) represent flagrant violations of the law on parliamentary replacement since the new deputies are from a different governorate than the original deputy. The constitutional provision for one deputy per 100,000 Iraqis – as reflected in the distribution key for deputies per governorates – is thereby also violated. Additionally, there are replacement cases that should have been challenged, but haven’t. Most prominently, they include Salim al-Jibburi of Tawafuq; a Diyala candidate who replaced a Salahhadin candidate. It is also unclear what happened to Daghir al-Musawi, who was supposed to replace a National Alliance candidate of the “Hizbollah in Iraq” party, but whose name is not to be found in the latest list of parliament members. It is possible that the National Alliance changed its mind in this case; if he had been made a deputy it would have been another violation of the rules since Musawi was a candidate in Basra and not in Maysan. What today’s vote shows is that once more the Iraqi political elite is unable to rise above camaraderie and cliquishness and make a principled stand on legal and constitutional issues. Until this tendency goes away, it seems unlikely that the assembly will be able to make the transition from serving its own interests to serving the people it is supposed to represent. The rumours began circulating yesterday and today they have been confirmed: Ayad Allawi, the leader of the secular Iraqiyya movement, no longer considers himself the candidate to the position as chairman of the projected “national strategic policy council”, a new political institution with ill-defined powers that was included in the grand political agreement on a new government by Iraqi leaders last November. It should perhaps be added that Allawi has gone far in dismissing the council in media interviews previously; his level of outspokenness on this occasion is however unprecedented. The council, an extra-constitutional concoction created largely to compensate Allawi personally for his thwarted prime ministerial ambitions, was always going to be a difficult proposition. Unsurprisingly, from day one there was disagreement on its exact prerogatives, with Allawi hoping it would include executive powers in key areas of government, and with Nuri al-Maliki and his all-Shiite State of Law alliance taking the opposite view of it, i.e. seeing it more as a deliberative think tank. Marshalling the arguments of constitutionalism and separation of powers, State of Law had some success in making the case that it would be hard to accommodate an additional executive institution in Iraq’s political system. It should be added that even the draft versions of the law that did exist had watered down the powers of the council and Allawi’s role in it quite considerably: For example, an 80% consensus requirement for decisions to have executive force meant that the council would rarely have played an active role in shaping government policy anyway – and that Allawi’s personal role as chairman would not be particularly prominent. Symptomatically, perhaps, the latest rounds of debate between the blocs have focused on petty issues concerning Allawi’s precise ceremonial status in relation to the existing ranks of leadership positions. It is to be expected that the whole project will founder if Allawi is no longer interested. Even as Allawi is making this dramatic decision, it is hard to follow his attempt at reorientation. The eminently logical thing for him to do would be to take as much of Iraqiyya as possible into a purely opposition role in parliament, where the bloc would be free to speak its mind on core issues that resonates with its electorate. Instead, today, he is reverting to old talk of good relations with the Sadrists, ISCI and the Kurds, apparently forgetting that those were the forces that ultimately betrayed his prime ministerial ambitions in summer 2010, and that a critical mass of them still seem interested in playing along with Maliki inside government. It cannot be stressed sufficiently that the strategic policy council was first and foremost Washington’s project in Iraq, and an attempt at keeping up appearances and creating a consolation prize for Allawi while tacitly – in the case of Ambassador Chris Hill, actively – accepting Iran’s push for a government formation based on a sectarian Shiite alliance. Last November, sources in the Obama administration gave glowing accounts of how American diplomats were present during the final negotiations where the deal on the strategic policy council was supposedly clinched, whereas the Iranians were absent. Today, four months later and with the apparent death of the strategic council, the power-sharing structure of Iraq’s new government is looking even more like 2006 than before.